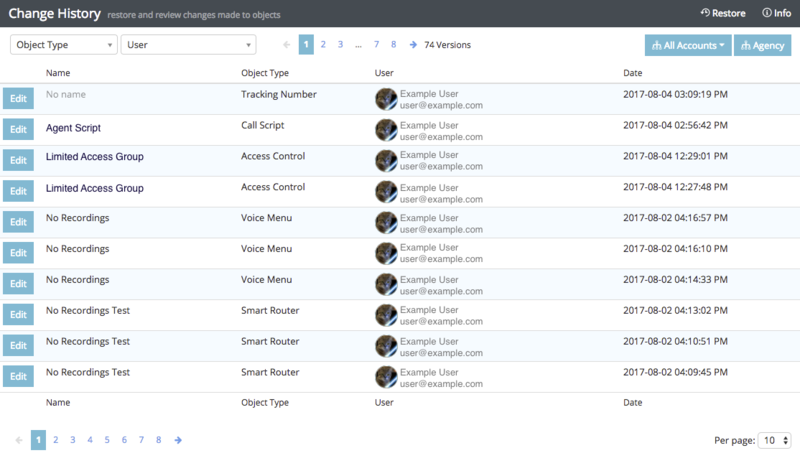 Changes made to areas of your account are logged as Versions in the individual feature pages. You can view a global log of those versions in the Change History page in your account. Versions and change history are kept for 7 days for individual accounts and 120 days for accounts that can create subaccounts. 1) Navigate to Numbers → Tracking Numbers. 2) Click edit to go to the settings for that number. 3) In the upper right, you will see a Versions button. Click this to view the change history for that number. You can restore past versions of a feature by clicking on the version you want to revert to. A pop-up will appear detailing the changes that will be made and asking you to confirm you want to restore that version. Click Restore Property to confirm. Some features have the ability to store deleted objects. If you deleted a voice menu, for example, and need to restore it to the account, you can use the Restore button on the voice menus page to re-add deleted menus back to your account. Deleted objects are only available to be restored for a short window of time, so exercise caution when deleting them from your account. You can view a log of all version changes on the Change History page, located under Settings → Change History. This pages compiles version changes from objects across the account into a single log, making it easier to get an idea of change activity on your account. Click Edit next to a change to be taken to that feature’s Versions list (where you can view the full details of the change, and restore versions as needed). You can use the Object Type and User drop-down menus to filter this view. If your account has subaccounts, you can use the All Accounts drop-down to view this log for all subaccounts at once.